The traditional top command gives a dynamic real-time view of a running Linux and Unix system. htop is a better alteraive to top command. It is also an interactive process viewer for Linux and Unix-like systems. It is a text-mode application for console or X terminals and requires ncurses. 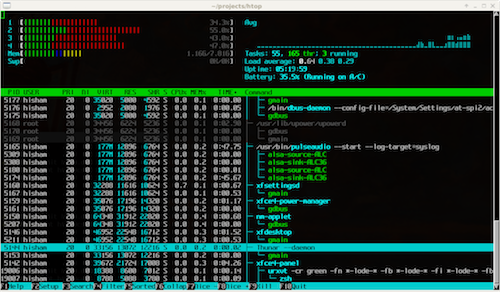 htop tool runs on Linux, FreeBSD, OpenBSD and Mac OS X.
htop is an interactive process monitor. It’s one of my favorite linux tools that I use regularly to monitor system resources. If you take top and put it on steroids, you get htop. htop has an awesome visual interface that you can also interact with using your keyboard. The screen packs a lot of information which can be daunting to look at. I tried to find a nice infographic to explain what each number, value or color coded bars mean, but couldn’t find any. Hence I decided to make one myself over the Christmas break. The htop is the first software I install on new Linux box. Htop is great. Try it out. PS: Also do check out explanation of everything you can see in htop/top on Linux.